This residence, nestled at the heart of Méribel showcases the Savoie region's architectural traditions. Divided between six stone and wood chalets, its apartments prioritize space. The interior design with its warm, welcoming colors and scalloped wood cladding exudes mountain charm. All accommodation boasts a balcony with views over the Alps. The Fermes de Méribel residence has dedicated fitness areas with saunas, steam rooms, fitness suites and an indoor swimming pool. The residence's final touch in terms of well-being is its "Deep Nature Spa" by Algotherm. 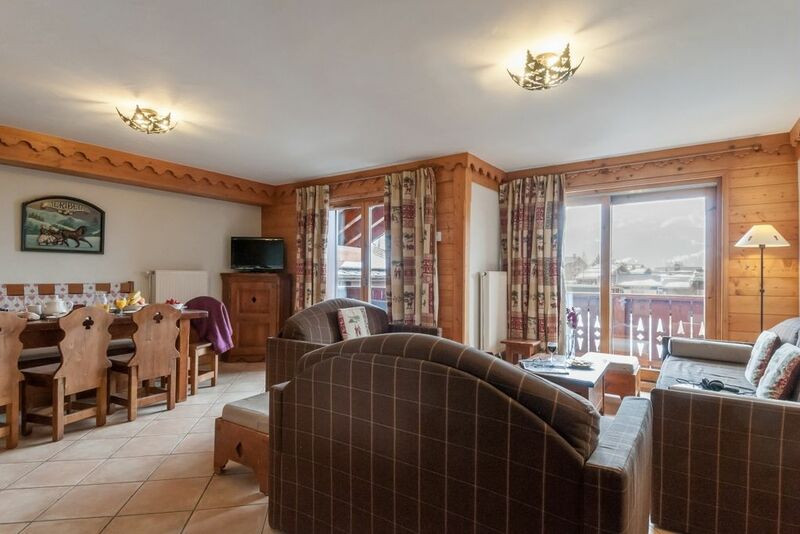 In a peaceful, wooded environment against the backdrop of the 3 Vallées. "Deep Nature Spa" by Algotherm services and an integrated indoor swimming pool. 1 bathroom or 1 shower room. NB: the pull-out bed provides extra sleeping space. In its majestic snow-capped mountain environment, the village of Méribel is an invitation to experience the joys of snow-sports. This lively resort will have guests of all abilities and non-skiers addicted to any number of activities during their winter holiday. - Kids' clubs and themed fun areas for children. - Deep Nature Spa treatment rooms in partnership with Algotherm. In M��ribel, an Alpine resort located at the heart of the Trois Vallées, the mountains live life to the fullest in winter and summer alike. At an altitude of 1,400 metres, the M��ribel Village, family resort which is a perfect illustration of the Savoie region with its wooden chalets, will charm you with its energy and wide variety of activities. - At the heart of one of the most unique ski areas in the world, the Trois Vallées, sports activities are numerous and various : climbing, sled dogs ride, hockey, skating, luge, snowmobile, but also handiski for people with disabilities. - Recharge your batteries thanks to the spa and the well-being spaces available within the residence, with fitness rooms, hammams and saunas. - Discover the 5 Meribel villages between 1,100m and 2,950m of altitude, corresponding to several areas which came to life at different periods of the resort history. - 12km away from the residence is located the Vanoise National Park, France's first national park, which offers landscapes mixing pines, cliffs, lakes, glaciers and meadows, and is the refuge to many animals. This place will attract hikers, with summits at an altitude of more than 3,000m. - This family resort offers an important diversity of activities for all ages : adventure park, rafting, paragliding, canyoning, golf, tennis, climbing, fishing, segway and many others. - Visit Menthon-Saint-Bernard castle, typical of the Savoyard architecture, located at the heart of the mountains facing the Annecy lake.